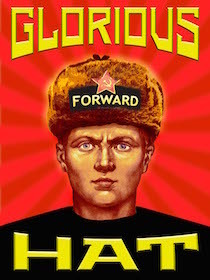 Nearly ten years here at Ushanka has left me cynical, sarcastic and opinionated. These, of course, are the top qualities of any successful blogger, and I wouldn't have it any other way. The market is down today. Actually, it is down for the year. But it is still up roughly 300% since Obama took office. The financial media are freaking out, as if a place where people trade is not supposed to have values that fluctuate based on changing realities in the national and global markets. Oil is down a ton because global growth is slowing, among other reasons. A dropping oil is one of the key signs of slowing growth, and the correct response is to lower expectations for companies dependent on growth. Lowered expectations leads to more stocks sold than bought. But watching the business media give investment advice disguised as journalism is like watching the GOP establishment bash on the leading candidate who doesn't tow their line. It is demeaning and unbecoming. And, I think, we are watching those with reduced credibility sell their remaining credibility for another few days of relevance. Here is the top headline today at MarketWatch. Is this not investment advice? How will investors feel if they follow this advice and the market loses another 25% and enters a multi-year period of malaise? Mac Slavo writes at Doug's site: CNN: Hey, Folks, Relax! Don’t Panic! Everything’s Awesome! Worry not that Walmart, Macy’s and scores of other retailers had an abysmal holiday season and are now set to lay off tens of thousands of workers. Unemployment, when calculated using models that were used during the Great Depression and that were defined out of existence by the government in 1994 show that some 23% of Americans are out of work. But we don’t calculate like that anymore, so we actually have an employment rate of about 95% in America right now. 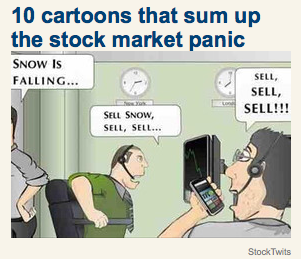 The financial media seems to want everyone to buy/hold, and is willing to make fun of you if you choose to sell. 3) If you can be cynical, look at every financial headline as an attempt to manipulate you.